With the New Horizons flyby of Pluto, we now know the small world has a rich geography with mountains and even a thin atmosphere. Pluto looks like it has all the makings of a planet, and yet astronomers still see fit to place it outside the realm of planets. While this is deeply frustrating to the general public, it’s clear that Pluto is very different from the 8 “classical” planets. It’s smaller than our Moon, and it’s orbit is more inclined and eccentric than the others. It also doesn’t meet the official criteria for what makes a planet. The official definition for a planet comes from a 2006 resolution of the International Astronomical Union (IAU), which defines a planet as an object which 1) orbits the Sun, 2) is massive enough to be in hydrostatic equilibrium (basically that means it’s round), and 3) it has cleared the neighborhood around its orbit. Pluto satisfies the first two, but not the third. And that’s unfortunate, because it’s that third point seems the most arbitrary. After all, asteroids cross Earth’s orbit all the time, does that mean it hasn’t cleared its orbit? Not quite. Earth is much, much larger than anything else in its general orbit. The same can’t be said for Ceres in the asteroid belt, or Pluto among other trans-Neptunian objects. It’s pretty clear from the IAU standards that neither Pluto nor Ceres are planets. While the IAU standard is pretty clear for our solar system, it isn’t so clear for exoplanetary systems. If we were to find a Pluto-sized object orbiting another star, how would we know whether it has cleared its orbit? But a new paper being published in the Astronomical Journal presents a new way to define planets that agrees with the current definition and can be used for 99% of known exoplanets. The new definition is based on the fact that any planet-like object in a solar system takes time to clear other objects from its orbit. The time it takes depends upon its mass (larger objects clear regions faster) and how close the object is to its star (closer objects orbit the star more quickly and have more chances to clear a region). That means clearing an orbit depends upon three things: the mass of the object, its distance from the star, and the age of the stellar system. From those three parameters you can define a threshold where an object’s orbit is considered clear. When the standard is applied to our solar system, Pluto and Ceres still don’t match the definition of a planet. They are far too small and too distant from the Sun. When we apply the same criteria to exoplanets where we know all three parameters, they all meet the standard of planet. That’s not too surprising, since we’re more likely to find large close exoplanets than more “iffy” ones like Ceres or Pluto. What’s interesting about this new method is that it could be used as the only criterion for defining a planet. Anything large enough to clear its orbit within 10 billion years will be in hydrostatic equilibrium, for example. Things get even more interesting if you drop the criterion of needing to orbit the star. The Moon, for example, is just massive enough to meet the criterion on its own, so under this definition we could consider the Earth-Moon system to be a double planet. And even though moons of Jupiter and Saturn are larger than our Moon, they are farther from the Sun and therefore don’t meet the planet threshold. 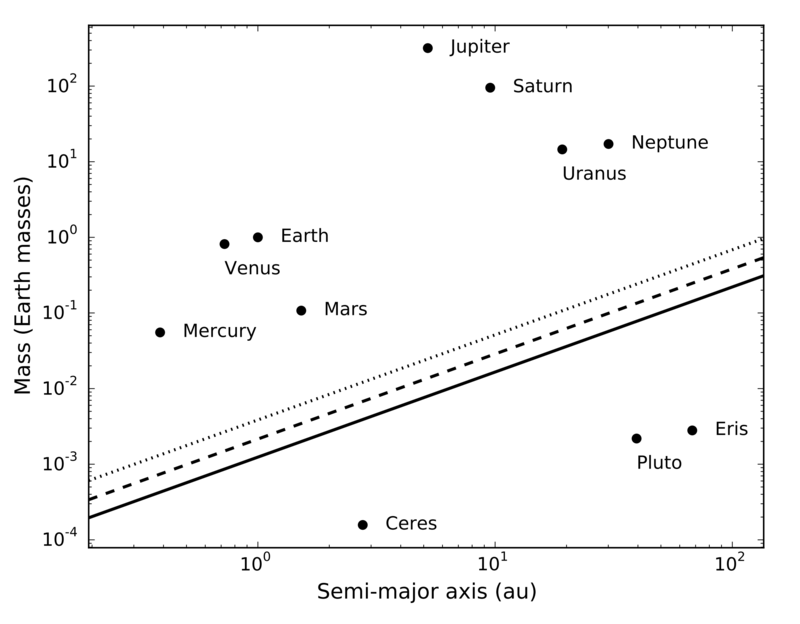 So while the method won’t bring Pluto back into the planetary fold, it would tell us which objects orbiting other stars have all the makings of a planet. Can you please explain how, based on new defintion is Neptune a planet when it hasn’t cleared pluto from its orbit. Neptune is more than 8,700 more massive than Pluto. Compared to Neptune, Pluto is just a large rock. Doesn’t bother me to continue classifying Pluto as a TNO or Kuiper Belt Object. Meanwhile, there can be little doubt about how to classify 2014 MU69, the 20 mile diameter rock that is the next target of New Horizons.